You are consumed by the music, writing, painting, poetry, dancing, whatever it is you make. How it makes you feel. There’s really nothing like it in the world. It consumes your every thought even when you are not doing it. Many times when I am not working on a song, story, or some other creative project, I am thinking about it. Planning it out in my head. Sometimes jotting down new ideas to implement later. If it’s music, it’s the chords, melody, or lyrics. The way it sounds when you hit that final note. The peace it brings you to know you made that. If you’re a writer, it’s getting those words out on paper, or getting feedback on what you wrote in a blog or book. If you are painter, it’s about the finished piece hanging up in front of you. The satisfaction that it is done. A thing made. Sometimes other people feel those same things about your art, but that doesn’t always matter as much as just how good it feels to make it. If only there was a way to make money at this. Whether that means you find someone to pay you to make art all day, or you just do it on your own and find a way to sell your art. It really doesn’t matter. You just want to to make a living doing it. Then comes the hard decision. Does it become the way you make your money to pay your bills and live? Should it? Can it? Going full time making art is not easy. It requires very low expectations of income. If you have a spouse making income enough to cover bills, and your family can live on that, it’s another story. 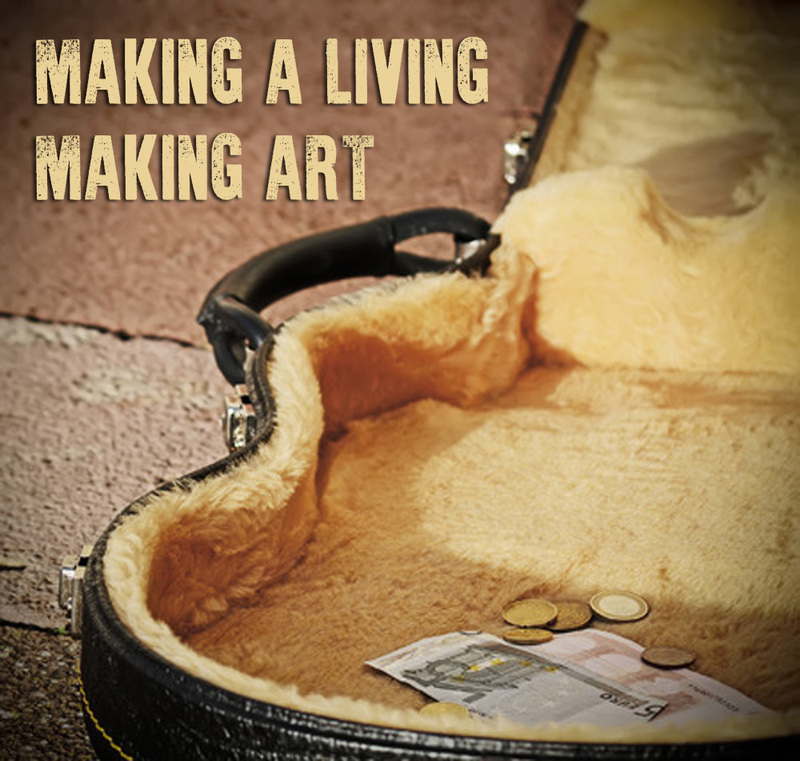 But if you are the chief bread winner for yourself or your family, being a full-time artist is more than challenging. Selling your art, whether in person in live concerts, showings, or other live events, or online sales requires supreme focus on events, new product, and sales, sales, sales. If you are hoping to support your family by being a performing artist of any kind, it means that booking yourself is as important as performing or even making new art. I think the real issue is that your “art” can become work, and that is a problem. Then the thing you love becomes this thing that has so much pressure on it to make money, that it ceases to be that thing you even want to think about. It’s just work. And that is no way to think about the thing which used to excite you and keep you dreaming about it all the time. This is especially the case if you work for other people doing your art. It can become very easy to be doing “their” art and not your own. They may even limit your artistic addition or ideas in favor of their own. This can be very irritating, if not downright soul-crushing at times. We jokingly call it “living the dream”, but it can become a nightmare over the years. People will say you are so lucky, but you will find yourself wondering why you aren’t following your muse like you used to. OK, if you aren’t completely depressed by now, let’s talk about some reasons to focus every bit of creative energy you can, and how to make a living doing it. I’ll start off by saying, if you can get to a point where most or even a portion of your bills are covered by doing creative things YOU love to do, there is no greater feeling. Even if that just means being able to treat your family to a dinner based on artistic earnings. Pretty cool. It may take years of trial and error, it may take being laser-focused on hard work, but you can make a living doing ONLY what you want. But you have to want it more than anyone else, and you have to MAKE it happen. Daily. I know a music ministry that has supported a family of eight traveling across the US in an RV for years now. But that would never happen without full time attention to not only performing, but also booking, planning, social media updating, tons of emailing, and living a life like no one else. But guess what, that’s what it takes. I sound like Dave Ramsey. You will live (sacrificing and working all the time) like no one else so you can live (as a creative full-time) like no one else. You’ll work 60 hour weeks and not think about it. Because it won’t feel like work. If you do it right, it will be fun and relaxing to do, and the hours you spend doing it will fly by. The biggest plus? You can leave the artistic legacy on this world that God put you here for (which you can also do if you don’t do it full time by the way). Now, what if you want to just do this part time? How do you do that along side your job? Well, that is another blog...maybe next week? Have a great week Creatives!